On Thursday December 20th 5:30-8pm, OEC is partnering with Baerlic Brewing at their BRAND NEW location to celebrate our participation in the Give!Guide! Join us rain or shine in raising a glass (and some cash) for clean air, clear water, and a toxic-free environment! Baerlic Brewing, together with friends of OEC, are generously MATCHING all gifts of $10 or more up to $1,000!!! One lucky $10+ donor to OEC will be invited to design and brew a beer with Baerlic Brewing. Drawing to take place in January—that’s worth at least a gajillion dollars, right? The first 15 donors to OEC of $150+ get dinner for two at QuickFish. Delicious! RSVP on the FB event page and please share it far and wide- COME HOP IT UP FOR OEC! 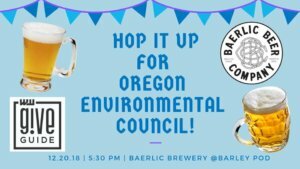 Cheers to enjoying a tasty pint of Baerlic beer and making a difference for Oregon’s environment!